Not an ancient torture method, but a useful practice exercise. So much in woodworking can be made easier through muscle memory. Drilling perfectly plumb with a bit and brace, planing a flat and consistent surface, sawing to a line, these are all things which can be done on a first attempt if you take your time and measure plenty. But with good muscle memory you don’t have to measure half as much, because your hands know where plumb is, or how to move pressure from the toe to heel of the plane as you traverse a board. But how to develop muscle memory? Practice. There is a not a huge amount of sawing involved in lutherie – once rough stock has been broken down to dimension only a couple of specific operations require a hand saw. As a result I’m less practiced, and less comfortable, with a handsaw than I am with my planes. Given that my big project this summer is going to be the Anarchist’s Tool Chest (a project which contains over 100 hand cut dovetails) I thought it was about time I improved the accuracy of my handsaw skills. Enter the Night of 100 Cuts. This simple exercise features 5 sets of 10 rip cuts, which are repeated twice to hit the 100 cut mark. I’ve found this exercise to take between 1 and a half, and two hours, so plenty short enough to build it in to a workshop routine (or even sneak in some extra practice after work). And this is an exercise which rewards practice with noticeable results after only a few repetitions. Where to start? With your favourite dovetail saw, and a piece of practice stock (I’ve been using 3/4″ thick pine and my Badaxe Toolworks 10″ dovetail saw). Use a marking gauge to mark on both sides of the stock a base line 3/4″ from the end. 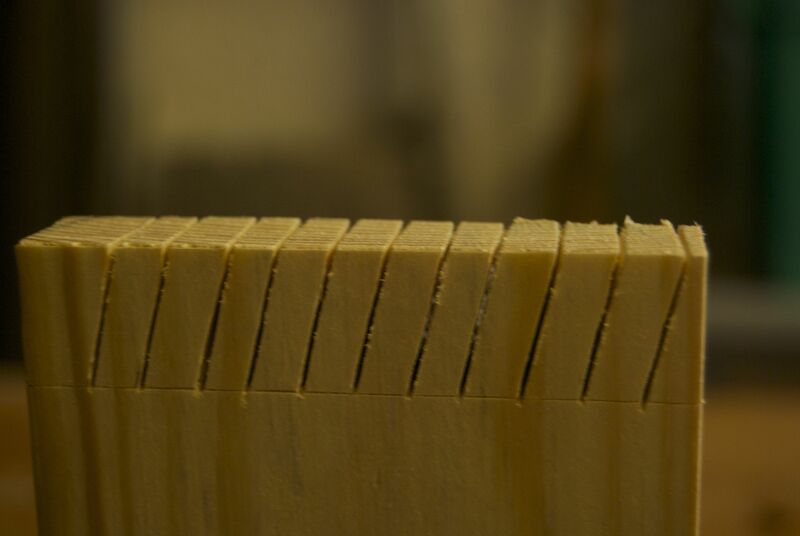 The first set of cuts is square across the width, and straight down. Make these, and then with your cross-cut saw of choice cut along the baseline to reveal a fresh end on the stock, and mark up for the second set of cuts. 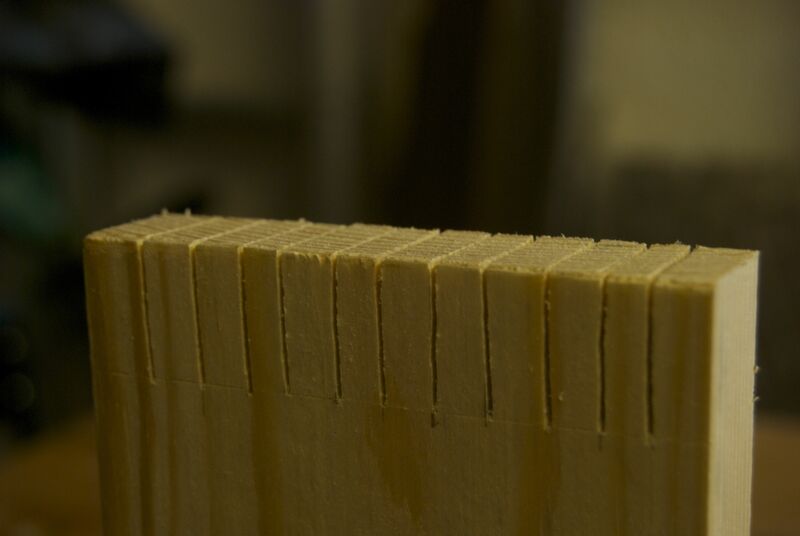 The second set of cuts is slanting to the left across the width of the stock, and vertical to meet the baseline (as you would for cutting one side of your pin board for a dovetail). I use my Sterling Tool Works dovetail marker to lay these out, although a sliding bevel, or free hand, works just as well. Make these practice cuts, and then trim off the stock with a cross-cut saw. The third set of cuts is the mirror image of the second set; slanting to the right, and straight down. The fourth set is where things get fun – square across the width, and slanting down to the left – the “tail” cut for your dovetails. The fifth set is a mirror image of the fourth – square across the width, and slanting down to the right. After running through this exercise a couple of times I noticed a significant improvement in my ability to saw to a line, especially on the slanting cuts. These pictures were taken on my second Night of 100 Cuts, and I have run through it a couple of times since, each time with visible improvement. The next stage of preparation for the Anarchist’s Tool Chest course will be some practice dovetails (my aim is to cut 30 practice joints during June and July), and I will write about those in a future post.